Thanks to visionary and dynamic administration, Ghent has evolved in the last 15 years from a rather sleepy provincial city to a bustling and lively spot where it is a pleasure to live, work and study. You can literally breathe in Ghent's rich history while strolling through the city center. The Gravensteen, the Oude Vismijn, the Duivelsteen, the Sint-Pietersabdij, the Graslei: these authentic monuments are just a stone's throw away from one another. The Belfort, the Sint-Niklaaskerk and Sint-Baafs Cathedral are Ghent's most prominent features. The towers are silent but imposing witnesses to Ghent's rich history. Ghent grew at the merging point of the rivers Schelde and Leie. The presence of water has been invaluable throughout the centuries for the economic development of the city. In prehistoric times and during the Roman Empire, the rivers formed a natural defense against possible enemies. Later in the Middle Ages, Ghent was able to benefit from the close proximity of the waterways, which allowed the city to grow to become one of the most important trade centers of the time. For further details and timetables, visit www.b-rail.be (Belgian Railways) and www.brusseslairport.be (Brussels airport). 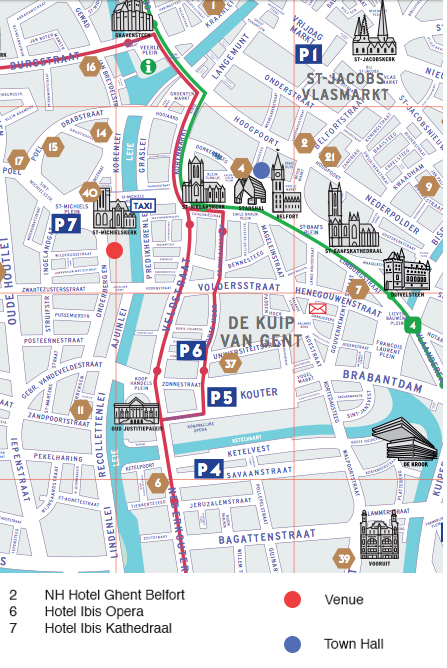 Ghent is easy to reach by train from all Belgian and European cities and is only half an hour from Brussels South Station (by 'IC' Inter City or 'IR' InterRegio train). Here the Eurostar and Thalys high-speed trains can rush you from Paris or London in 1,5 hours and from Amsterdam or Cologne in 2,5 hours. At Gent-Sint-Pieters railway station you can browse information at a digital 3D information point. From the E17 you take the 'Gent Centrum' turnoff. On the E40, from the motorway intersection in Zwijnaarde you first follow 'Antwerpen' (E17) and then take the 'Gent Centrum' turnoff.